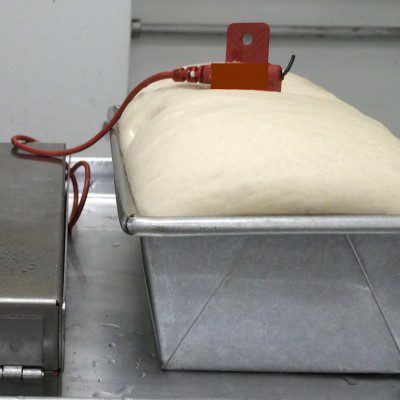 Thermocouples are inserted into dough to give a thermal profile. Thermal profiling is useful when a new product is launched. If your new product is experiencing dryness issues, you could be overbaking it. This can easily be remedied by adjusting time and/or temperature. But how much time and temperature do you have to reduce? This is where thermal profiling can help you adjust the baking temperature and baking time for the commercialization of a new baked product. As with most high-speed lines, the oven could be the bottle-neck of the entire process. Which means, that its flexibility for a throughput is very limited, and you only have a small window of a few minutes to play with. With this in mind, send your first thermal profile reading through the oven. We will call this Bread A. Ovens operate with different burners and dampers for different zones. Therefore, understanding what Bread A experiences throughout the baking process will help us manipulate the thermal profile for Bread B. For this experiment, we used 175 g per loaf for bread A and 200 g per loaf for bread B. We used ECD thermal profiler with M.O.L.E. MAP3 to record the temperature profile during baking. Table 1 shows the vital information from thermal profiles. Figure 1 Thermal profile for Bread A. Figure 2 Thermal profile for Bread B. When we look for adequate bake, we usually target a crumb set (Arrival) of 85%. If this number goes below 85%, like in the case of Bread A (63%), it means that the bread is over baked. You would need to adjust the oven by making the Arrival value higher and closer to 85%. Take a closer look at Figure 1. If you are working in this file using the M.O.L.E. program, bring the process end line closer to 19 minutes, and you will see the proposed Arrival rise up to 80%. We used this to guide us on how to set the oven time to bake Bread B. For Bread B, we reduced the baking time to 19 mins. This brought the Arrival to 77%. Although not as high as 85%, this indicated to us that we could further reduce the baking time. This is a simple, time manipulation test using the thermal profiler. In an actual production scenario, both temperature and time need to be manipulated to fit the line speed. Therefore, targeting a crumb set (Arrival) of 85% is where you should start. Over baking bread occurs when crumb set (Arrival) goes below 85%. Bread in this experiment was over baked. To increase Arrival from 63% to 77%, baking time was reduced by 3 mins. Arrival would have increased to above 80% with 19 minutes with this experiment, if it weren’t for the increase in dough weight. Further increase of Arrival can be experienced by further reducing the baking time. Thermal profiling is helpful in determining an adequate bake.